Toss a coin 3 times. If at least 2 of the results are Heads, select 1 card on your opponent's side of the field and destroy it. This effect can only be used once per turn during your Main Phase. Ahh, the short-print Ultra Rare of Ancient Sanctuary. So much superior to Barrel Dragon in every way. Why? Quick rundown...Witchable, one-tribute, only 300 attack less than its two-tribute cousin, and THE EFFECT CAN KILL M/Ts. Also, it's Dark, so it can safely replace Jinzo in a Deck and still be Chaos food...or be added to a Chaos deck and you can remove one of the other many Dark monsters. Expect for this monster to be competing with Vampire Lord, Airknight Parshath, and one other card for the second Tribute slot. Blowback Dragon was one of the most highly anticipated cards in Ancient Sanctuary. Why? Well, people love Barrel Dragon, so they’d obviously love his even more playable counterpart more. His stats are fairly good for a Level 6 monster; he has a Witchable 1200 DEF and a respectable 2300 ATK. He's DARK, so good for Chaos; and he's a Machine, so good for Machine Decks. 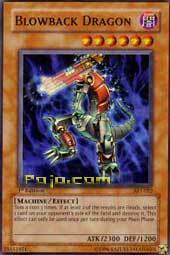 His effect is much like Barrel Dragon’s, only if you succeed, you get to destroy M/T as well as monsters. This makes him much more versatile: If your opponent has no monster but a face-down Trap that's worrying you, just bring out Blowback Dragon and try to get rid of it. Granted, the effect is based on chance; but unlike some cards (ie Time Wizard), Blowback Dragon can hold his own even if luck isn't with you. With Limiter Removal he becomes a 4600 ATK monster...very brutal. set thoroughly and picking good cards. Anyway, lets get to the review. Heads, select 1 card on your opponent's side of the field and destroy it. small payment… As you can see I likes this card. This card is a mini, upgraded Barrel Dragon. I had the chance to pick one up this weekend and I tested it and it was great. Being able to destroy any card, as compared to Barrel which destroys only creatures, is a great thing. The only problems were witch, sangan, and chainable traps. 2300 attack isn't bad either. 1200 DEF makes him searchable by witch and being a machine gives him the ability to combo with Limiter. You have to get 2 outta 3 coin tosses land on heads to get it's a effect, which is slim, but not too slim of a chance. 2300 attack also doesn't stand up to EoA, Jinzo, Goblins can suicide, Freed can suicide, and Dark Ruler beats it. It's also a tribute monster, which makes it kinda slow. 1200 DEF won't stand up to much if it goes to defense mode. It's Ultra Rare, so it'll be hard to get. Finally, when combined w/ Limiter, it'll die. Overall, I give Blowback Dragon a 8.1/10. It's a good card, but should be in every deck. It's fun, too.